If you are looking for premium-quality and stylish clothes for your little fashionista, we recommend you to look through the collections of Molo, Marcelo Burlon, Tommy Hilfiger and many other designer trademarks presented on our website. Fashionable clothes are something every boy wants to wear day after day. 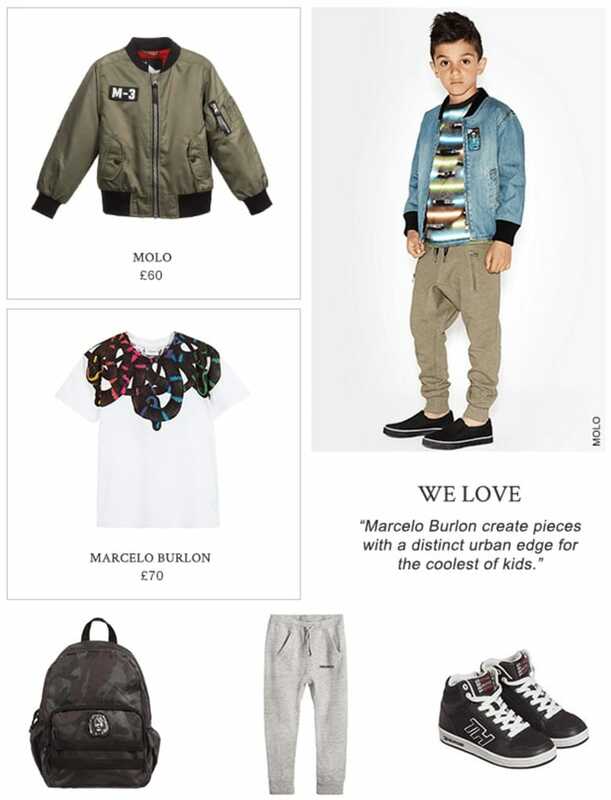 Molo offers a few nice options of casual boys’ wear. A lovely denim jacket, brightly colored T-shirt and loose light-brown trousers can be worn on a daily basis as a highly fashionable and stylish outfit. The brand also offers a nice durable shoulder bag which your little fashion-lover can wear during long walks and various entertaining activities to keep all necessary things at hand. Molo offers a fashionable brown jacket as well. It will definitely suit the taste of your child and bring him much pleasure and comfort. DSQUARED2 also provides a nice variety of boys’ wear including stylish grey sports trousers that your child will absolutely enjoy wearing day after day as they are comfortable and well-fitted. As for the choice of footwear, we recommend you to look at the sports shoes offered by Tommy Hilfiger. All footwear is made from top quality leather material that is breathable and durable at the same time. Your kid will definitely like the style and design of sports shoes offered by Tommy Hilfiger. Black sports shoes with white laces and soles would be a nice option for everyday wear. Your child will enjoy wearing them during the long strolls around the town or enjoyable activities that require comfort and coziness of little feet. Check out the most recent collections of boys’ wear offered by the leading designer brands. The designers of the brands have thought out every detail for your child to have the best outfit in the neighborhood. Make your child’s dreams come true! No matter whether your little kid is fond of fashion or you just want him to wear comfortable and stylish clothes, we recommend you to look through the collections of Marcelo Burlon, Molo, Tommy Hilfiger and many other brands available on our website. The designers of the brand offer a great range of shapes and colors to suit your kid’s taste in fashion. Molo provides a wonderful outfit for little fashionistas. A stylish denim jacket, colorful T-shirt and loose trousers presented in light brown color would be the best choice if you want your kid to be dressed in fashionable clothes. Comfortable footwear is another must-have item in the wardrobe of every child. You might wish to consider buying sports shoes by Tommy Hilfiger available in black color with white outer soles and shoe laces. Such footwear will make the outfit of your child even more stylish and incomparably fashionable. Molo also provides a wonderful range of shoulder bags available in different colors. A shoulder bag is a must-have item for every young explorer of the world. It will help your child keep all the necessities at hand in order to enjoy his day-to-day activities. DSQUARED2 provides a fabulous range of sports trousers. Grey trousers will be a good choice. They are comfortable to wear and look extremely stylish. They will make your child feel cozy and comfortable during the daily activities and look great at the same time. The Molo brand offers a brown jacket that can be combined with loose brown trousers to complete the outfit of your child. Marcelo Burlon provides a fantastic range of colorful T-shirts with bright prints and nice little details. All the above will make your child the coolest-looking kid in the neighborhood and he himself will be delighted to wear such fashionable and stylish clothes.